War Thunder Update 1.69 for PS4 is now available for download. The latest update is also known as Regia Aeronautica and it unlocks Italy as the sixth nation. The update adds new aircraft and tanks. In addition, the update also includes full 4K PlayStation 4 Pro support. The new Italian aircraft tree stretches from Italy’s famous biplanes of the 1930’s to its powerful jet fighters of the 1960s. Among the latter is the Fiat G.91, a light, fast and agile fighter-bomber. Italian bombers include highlights such as the heavy four-engined Piaggio P.108B, which can carry a staggering 3.5 tons of bombs or three torpedoes. Its sister model, the ship hunter P.108A, comes equipped with a massive 102mm anti-ship cannon with 50 rounds of ammunition, which is now the largest aviation weapon in the game by far. All players will get gradual access to the new nation’s aircraft, with new models being unlocked for research every few days. The United States gets access to a new top-rank vehicle, the M60A2 “Starship”, which can fire both conventional shells and guided-missiles from its 152mm cannon. For the Soviet Union, the T-55A is introduced as a worthy successor to the T-54, sporting excellent close combat and flanking capabilities. The Japanese tree sees improved version of the Chi-To Late version. Fans of the British vehicles will be able to obtain Churchill Mk.I, the older brother of the Churchill Infantry tanks that are already presented in the game and rank 5 reinforcement – the mighty Vickers Mk. 1. A completely new feature in War Thunder are smoke grenades and smokescreen launchers. 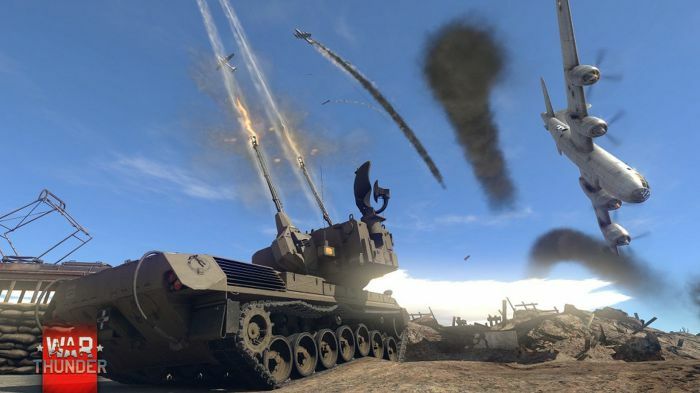 The first will allow tankers to deploy protective smoke over large distances, while the latter are an effective method to hide from enemy fire while repairing on the battlefield or defending a capture point. The ground battles location ‘Kuban’ has been greatly revamped, which will make tank combat on the new location much more tactical and varied. For pilots, the hot sands of ‘Tunisia’ await. Knights of the Sea pre-beta testers will be able to try the Black Sea Port! Now, War Thunder fully supports the improved performance of the PlayStation 4 Pro console, allowing owners to play War Thunder in 4K resolution. E100 – Grill texture has been corrected. Tiger II (H) Sla. 16 – Display of track slack has been corrected. IS-2 1944 – Black textures displayed at some distances have been fixed. Sherman Mk Vc Firefly – Historical engine has been added to X-Ray mode. Churchill Mk.VII – Tracks traversing through track side guards have been fixed. RakJPz 2 – Display of machine gun belt for the anti-aircraft machine gun has been added. Check out full War Thunder update 1.69 changelog over here.